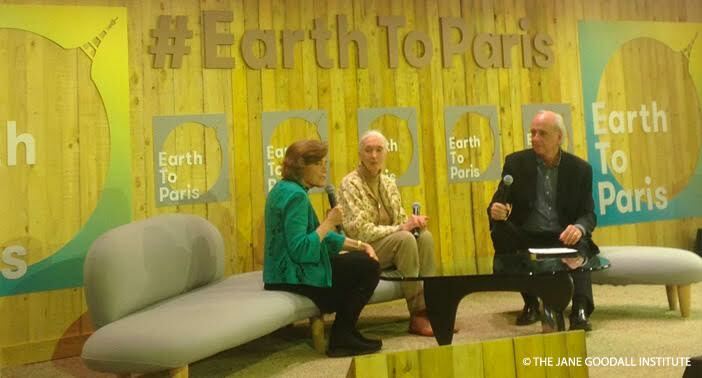 On December 7th, world famous primatologist Dr. Jane Goodall and oceanographer Dr. Sylvia Earle announced the launch of the Tapestry of Hope at the 21st Conference of the Parties (COP21) in Paris. As world leaders gather together in Paris at COP21 to devise a plan to combat climate change, the Jane Goodall Institute and Mission Blue share new online tool, the so called Tapestry of Hope, to highlight projects young members of Jane Goodall’s Roots & Shoots and Mission Blue have led to help people, animals and the environment we share. The Tapestry of Hope is an interactive map which allows users to see the locations and details of thousands of projects, and represents an even larger global community of Roots & Shoots youth and Mission Blue supporters. This map weaves together the impact of hundreds of thousands people, inspired by Dr. Goodall and Dr. Earle’s message of hope to take action and create positive change for their communities and our world. Click on the image above to view the full interactive Tapestry of Hope. The map uses Esri’s platform, a mapping technology that supports JGI with community mapping, land use planning, and chimpanzee behaviour research in Africa. Mission Blue’s Blue pinpoints represent “Hope Spots” outline areas of protection and aid for ocean life, and JGI Roots & Shoots green pinpoints represent the power of youth in protecting our world. Together, these pinpoints not only reflect the impact of Dr. Jane Goodall and Dr. Sylvia Earle, but also inspire hope for the future. While world leaders discuss the harm caused to the environment since COP20, the Tapestry of Hope serves as a reminder of what positive impacts have come from a passionate, driven, and hopeful generation. Dr. Goodall’s Roots & Shoots program is proof that “every individual matters,” and that every individual, youth or adult, has the potential to take action, and become part of a new pinpoint on the Tapestry of Hope. Click here to read the press release on The Tapestry of Hope. I’m impressed, I must say. Truly rarely do I encounter a website that’s equally educative and interesting, and I want to inform you, you have struck the nail to the head.